This week, USPTO published a patent application by Apple which suggests that Siri will be interconnected to all their devices via a same user profile. Connecting all the devices will help Apple give its user real IoT experience. Apple will be able to control his TV via his Apple Watch, for example. Last year 9to5 Mac also opined that Siri should connect all Apple devices. Google’s personal assistant already does that where it connects a smartphone to Google Home to Android Watch. Last time when Apple made Siri responds to only one nearby device among multiple via a voice command, the feature became a hassle for those having multiple Apple devices nearby. The current update may clear those clouds of doubts for Siri. The patent application says that it will become smart enough select a device among multiple to run a particular command. Apple’s Siri is one of the best personal assistants and this new feature will help it to play up to its reputation. 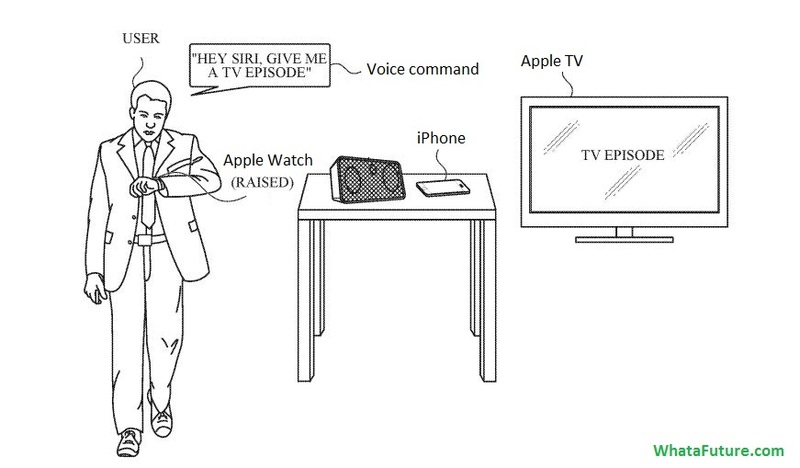 The below image from patent showcase a user giving command to Siri for watching a particular show on TV. There are few things mentioned in the patent which I believe I should let you know. These features are about when Siri won’t be an obedient assistance anymore and instead will play a role of someone who cares for you. First, if you will be driving and you give a command, Siri won’t be following your orders. It will instead ask you to focus on driving. Another situation where if won’t follow your orders will be where authentication is a must. For example, if someone utters Play Deadpool, then before playing it on your TV, it will confirm your identity. This will help prevent misuse in many scenarios. Besides, Google is also teaching its assistant some new stuffs. Apparently, Google Assistant will use multiple devices to decipher the exact voice commands from a distance. Previous Previous post: How Microsoft’s dual display will narrow the gap between Tab and Laptops? Next Next post: An Indian Halwai filed a design patent for Jalebi, wait… what?